In 2009, REV'IT! set out to make the most indestructible textile hot weather outfit on the market. The result of their toil is the REV'IT! Turbine Jacket & Pants, the premier protective ADV Touring mesh combo out there. A veritable monster of a combination, the Turbine outfit's outershell is constructed of 500D & 750D Powershell with 1000D Cordura reinforcements and heavy-duty (but breathable) Dynax mesh. SuperFabric, panels of laser-welded ceramic plates, can be found in the impact areas, offering 14x the abrasion-resistance of Kevlar. Upgrading from their basic Knox armor, REV'IT! utilized ProLife CE protection at the shoulders, knees & elbows. ProLife's protection is in line with a CE Level 2 rating, although they only use that scale for back protection. Perforated Temperfoam comes stock as the backpad, but it is upgradeable to either the Knox back protector or the SAS-TEC back protector. So that's the protection side of things. You can be assured that you'll be safe with this outfit on. Next up is airflow. I already talked about the Dynax mesh panels. They are everywhere in this outfit. 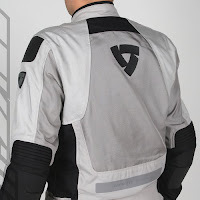 You have four large panels in the chest, panels that run the entirety of the inner arm on each sleeve, enormous panels on the front and back of each leg, and a mammoth exhaust panel on the back of the jacket. The best part about the breathability is the fact that the mesh itself is tightly-woven for superior impact protection. Like I said earlier, this is the summertime textile outfit. 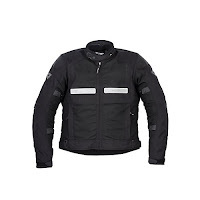 Check out its competitors in our mesh motorcycle jackets and summer motorcycle pants section on over at RevZilla.com.